Two impressive young black Limousin bulls from the Westhall Herd, sold for 11,500gns and 11,000gns respectively to top the sale of Limousin bulls held at Stirling on Monday 4th February 2019. In all the Westhall herd of Mary Fotheringham, along with the husband and wife team of Robert & Hazel McNee, had a tremendous day’s trading that saw them sell all of their pen of five bulls to gross 38,500gns at a mighty average of 7,700gns. Leading the way was the June 2017 born Westhall Norris who earlier in the day had been placed as Reserve Junior Champion by the pre sale show judge, and noted commercial and pedigree breeder James Thomson, Hilton of Beath, Kelty, Fife. This bull is by the homebred herd sire Westhall Jammy, a Newhouse Glamis son whose pedigree features Newhouse Teak a top breeding female in the Newhouse herd. Westhall Norris, who is out of Westhall Freespirit was purchased for the sizeable commercial enterprise of D Walker & Sons, Camregan Farm, Girvan, Ayrshire. The 11,500gns top price was also the top sale price achieved by the 80 pedigree cow Westhall herd to date. From what was his first crop of calves at sale, Westhall Jammy featured as the sire of the top two prices. In addition to his pedigree calves, commercial progeny from this bull have been showing tremendous carcase traits in length and yield when hanging up. Taking the second top price of 11,000gns was the first prize winner in class four in the shape of Westhall Nathan. Full of breeding this May 2017 born bull is another Westhall Jammy son and is out of Westhall Hlame who has herself previously bred the 11,000gns Westhall Landman. Purchasing Westhall Nathan was the noted commercial producer Peter Alexander, Mains of Mause, Blairgowrie. Mr Alexander, who runs one of the largest Limousin commercial herds in the UK, bought four Limousin bulls through the sale. Both of the Westhall top priced bulls featured strong performance figures for a combination of calving ease, growth and carcase traits and this was a trend continued through the sale. “There was a solid demand for the bulls forward and a very healthy 80% clearance rate reflects that. It was clear that buyers had set budgets to work to and picked the bulls meeting their criteria. Bulls with the genetics and performance figures for easy calving, growth, weight for age, and age to slaughter were in demand and sold very well. The breed now moves on to Carlisle within the next fortnight where there will be another 200 Limousin bulls catalogued”. Selling at 9000gns was the stylish Reserve Supreme & Intermediate Champion, Anside Nemesis from the Irvine family at Braehead Farm, Drummuir, Keith. The first prize winner in class six this was another bull with a strong and proven pedigree. Sired by the herd’s prolific stock bull Powerful Irish, this June 2017 born calf is out of Bailea Cadee who herself has bred many of the herd’s show heifers at the Royal Highland. Again with a strong set of performance figures, Anside Nemesis was bought by A Kennedy & Son, Seggarsdean, Haddington. The Anside herd stock sire Powerful Irish has bred bulls up to 13,000gns, and to an average of over £7000 for some thirty plus bulls sold. In May 2018 the Powerful Irish sired Anside Magneto topped the Stirling Limousin sale at 12,000gns. Messrs J R MacGregor, Dyke Farm, Milton of Campsie, Glasgow, made 7200gns when selling the April 2017 born Dyke Nilegod. Another with good all round figures including growth and carcase traits, this bull is by Dyke Gandalf, a Fieldson Alfy son, and is out of the thirteen year old cow Dyke Amazon. Taking this bull home was J&J Wylie, Knockhouse Farm, Crossford, Dunfermline. Another from the MacGregors, Dyke Nero, made 6500gns and was purchased by R Easson & Son, Barns of Airlie, Kirriemuir, Tayside. A first prize-winner from the second class this April 2017 bull is by Netherhall Gilbert, a Haltcliffe DJ son, and is out of Dyke Glam. Four bulls in all made 6000gns. The first of these was Elrick Nevada, the Reserve Senior Champion, and second prize in the strong first class, from Mr MJ Massie’s fifty five cow Elrick herd at Mains of Elrick, Auchnagatt, Ellon. This bull is by the homebred sire Elrick Jethro who is sired by the 23,000gns Rahoney Geoffrey and whose dam line is described as being the best in the herd. Elrick Nevada is out of the second calver Elrick Gagrielle, a Craigatoke Dundee daughter. Lifting the Reserve Senior Championship here, the Elrick herd has previously won the Limousin Supreme Championship on two occasions at the Stirling February Sale. Purchasing Elrick Nevada was J&J Pattullo, Sandyford, Kirriemuir, Angus. 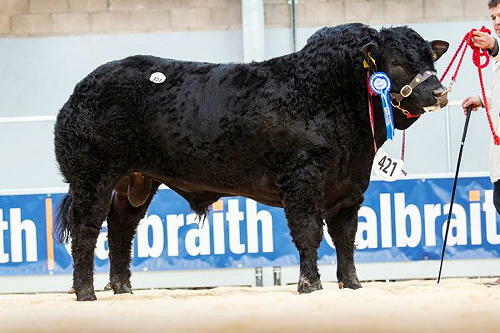 Local breeder, and prolific seller a Stirling, Andrew Burnett, Upper Spittalton Farm, Blair Drummond, sold two bulls at the 6000gns mark from his 90-cow Spittalton herd. Both bulls were from the first crop of calves at sale by the ‘easy calving’ 16,000gns stock sire Dinmore Jeanpierre, a Diamant son. First up was the May 2017 born Spittalton Nebraska who was snapped up by A&R Paton, Easter Greenhill, Avonbridge. This bull is out of Spittalton Harriet who is a daughter of the noted Sympa. The second bull from the herd at 6000gns was the Reserve Intermediate Champion, and first prize bull in class five, Spittalton Norman. May 2017 born Spittalton Norman is out of the consistent breeding Spittalton Fifi whose half sister is the noted Spittalton Flush, the mother of the 65,000gns Aultside Meanmachine. The Reserve Intermediate Champion was one of four bulls purchased by the Scottish Government Bull Stud, Inverness. The Final bull at 6000gns was Westhall Nickson from the Fotheringham & McNee’s Westhall herd in the shape of the black bull Westhall Nickson. Having stood third in his class, won by the Westhall herd’s Reserve Junior Champion, this bull was picked and purchased by John W McEwen & Son, Mount Farm, Balfron, Glasgow. Another to feature strong growth and age to slaughter figures, Westhall Nickson is a further son of Westhall Jammy and is out of the seven year old Westhall Highhope, a Stotsfold Dragon daughter. The Overall Supreme Champion, Junior Champion and first prize in the seventh class was Goldies Novel from Bruce Goldie, Townfoot, Mouswald. This July 2017 bull is by the 22,000gns Goldies Fandango and is out of Goldies Goldilocks who was noted as being potentially the best breeding female in the herd. In a remarkable statistic this is the third consecutive February Limousin Sale at Stirling where the herd has won the Supreme Championship and on each occasion with a different homebred sire. On the day the bull was bid to 8500gns but was unsold at that price.